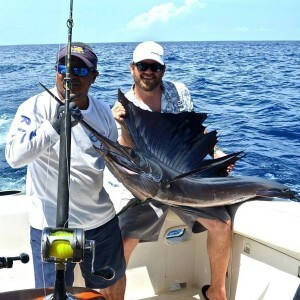 Marina Pez Vela Fishing Charters offers World Class Offshore Fishing, Deep Sea Fishing and Inshore Fishing Charters in the Marina Pez Vela, Quepos, Manuel Antonio, Costa Rica. Our Luxury Fishing Yachts located in the Marina Pez Vela are fully equipped to provide you with the best offshore and inshore fishing experience in Quepos, Costa Rica. Wether you are looking to book an offshore fishing charter or sometimes called deep sea fishing and inshore fishing, our luxury fishing boats will provide you with a world class fishing adventure. Our family has been in the tourism business with yachts, for over 22 years, here in Quepos, Costa Rica. In those early years, there was no marina. That’s right, just a pier. We all had our boats moored near that pier, and we used a panga to ferry our customers from the pier, to our boats. Nevertheless, fisherman came to Quepos to fish. Fisherman viewed it as a minor inconvenience, which they gladly tolerated in order to fish in the world class Big Game Fishing waters off Manuel Antonio, Quepos. The fishing is still some of the best in the world, but now anglers are also treated to a world class marina. Marina Pez Vela is now home to many of the biggest International Bill Fish Tournaments. In fact, both our luxury fishing yachts participated in the 2015 Offshore World Championship Tournament. This New and Beautiful Marina is a great place to come and visit. Marina Pez Vela offers a fully equipped Yacht Yard, featuring Central America’s only 200 Ton Marine Travelift. 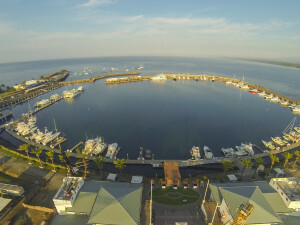 The Marina Pez Vela is home to largest travel lift in Costa Rica. This is an impressive machine, can pull small to very large boats out of the water. The Marina Pez Vela also offers a full boat yard service. This is no ordinary boat yard, it is fully equipped with the best machines so you can do all types of jobs on your boat. Want to paint the bottom of your boat? Looking to chance propellers? Whatever you need to do on your boat, you can do it at the Marina Pez Vela Boat Yard. The staff at the Marina Pez Vela are very profesional and friendly, and are all english spoken. This Marina is truly changing the Tourism and Boat Industry in Quepos, Costa Rica. Not only does the Marina have great facilities for your boat, but it also offers a wide variety of restaurants that serve delicious food, prepared with only fresh ingredients. During the day time, the Marina is always filled with people from all over world that are about to begin their morning activity, wether it be on a fishing boat or on a catamaran tour, you can be certain that the Marina has the best boats to offer any recreational activity at sea. The evening time at the Marina Pez Vela is a perfect setting for couples and families to come and enjoy a relaxing and fun night with delicious food and good music. If your next vacation is to Costa Rica, you need to come and visit the Marina Pez Vela, you wont be disappointed.